Don't Miss the €200,000 GTD PokerNews Cup Main Event This November! Get ready for the ninth edition of the PokerNews Cup, which will take place later this year at King's Casino in Rozvadov, Czech Republic. The festival runs from November 18-23, and the latest edition of PokerNews' own live tournament series aims to be a festival to remember! The PokerNews Cup was created to give recreational and first-time players a chance to gain a taste of a professional poker tournament with a reasonable buy-in. The 2015 PokerNews Cup features a large number of events that include a €120 buy-in opening event with a €20,000 guarantee, a €10,000 guaranteed pot-limit Omaha €100 buy-in tournament, and one of the biggest main events in the Cup's history — a €200,000 guaranteed Main Event accessible for as little as €250. To give an even more professional feeling to the event, the PokerNews Live Reporting Team, which is currently at the European Poker Tour Barcelona, will provide live updates from the 2015 PokerNews Cup, which of course will include videos and interviews that will appear on the whole PokerNews international network. People want competition, professionalism, and value — and this is what everyone who works at the PokerNews Cup is committed to. iBus Media and PokerNews CEO Jon Squires said he was looking forward to the event after the success of the past edition. "We are proud to announce that the PokerNews Cup will head back to a prestigious location like King's Casino," he said. "We are ready to continue our support our players, by giving them the opportunity to get into some great poker action and enjoy a premium live event for the same low buy-in." According to Squires, the small entry fee is a crucial aspect in the success of the PokerNews Cup, especially as it comes with a six-figure guaranteed prize pool. "The fact that many players do not want to spend thousands of Euros to play at live events does not mean that they are ready to sit at any low buy-in tournament," Squires continued. "People want competition, professionalism, and value — and this is what everyone who works at the PokerNews Cup is committed to. "We have learnt a lot from the past, and I can promise you that the feedback that we have received from our players, combined with the experience PokerNews has developed on the field, will make the PokerNews Cup once again one of the best low buy-in events of the season in Europe." King's owner Leon Tsoukernik agrees with Squires, and he is also sure that the next PokerNews Cup will attract a massive field of players, and exceed everyone's expectations. "I am extremely happy to continue working with PokerNews and it's an honor for the King's to host the PokerNews Cup for the second time in 2015," said Tsoukernik. "King's and PokerNews are an ideal match because we both strive to make the poker industry grow through excellence. We have proven this in the past, and we have the knowledge and the experience to do even better in the future." Tsoukernik says that King's Casino aims to have cash tables and casino games running around the clock, and staff will be able to take care of every guests to ensure they enjoy their time in Rozvadov. “This, combined to the unique visibility that a media like PokerNews can give to the event, will make the PokerNews Cup an incredible moment to enjoy live poker at its finest,” Tsoukernik explained. 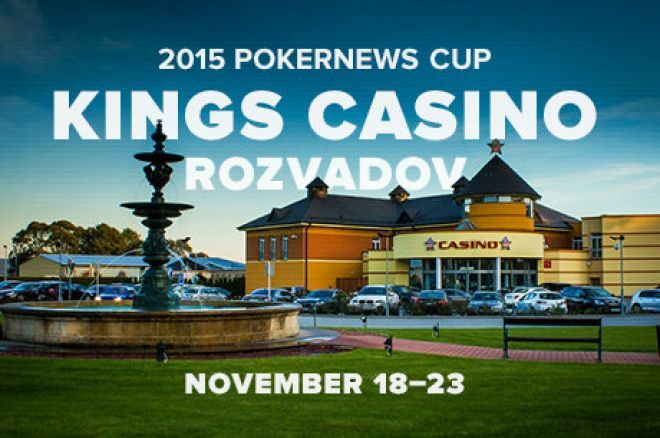 Earlier this year, the PokerNews Cup headed to Rozvadov for the eight edition of the series. Running from Feb. 4–9, the event offered an action-packed schedule of tournaments highlighted by a €250 buy-in Main Event that attracted a field of 1,550 and crushed the €200,000 guarantee. The tournament, which was won by Germany's Christian Krupp for €57,473, also attracted a good number of poker pros including World Series of Poker (WSOP) bracelet winner Jörg Peisert, Eureka Poker Tour regular Eusebiu-Niclae Jalba, and the Czech Republic's Michal Maryška, who currently sits 10th on his country's all-time money list. For further information about the PokerNews Cup, visit the event's official website.